A native to China and Korea. An open branching tree, giving slight shade. 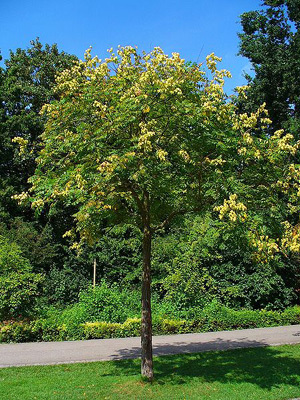 Choice specimen tree where space is limited. Leaves are alternate, pinnate or bipinnately compound to 14" long, 7 to 15 leaflets, ovate to ovate oblong, 1 1/4" to 3" long, coarsely and irregularly serrate. New leaves are purplish, maturing to bright green in summer; may turn yellow to gold in autumn. Very showy, 8"-14" long flower clusters appear in early to midsummer. Fruit capsules are red when young, maturing to shades of brown; resembling little japanese lanterns. Adaptable to different soil types. Has a moderate growth rate. May reseed and become invasive in warm winter climates where water is available.